This photo shows part of a Barrier Canyon Style pictograph panel found in one of the most unusual places, as it is found inside a large hollowed-out boulder. Once you stick your head inside (or your whole body since it’s big enough), you are treated to a spectacular 360 degree display of ancient paintings. 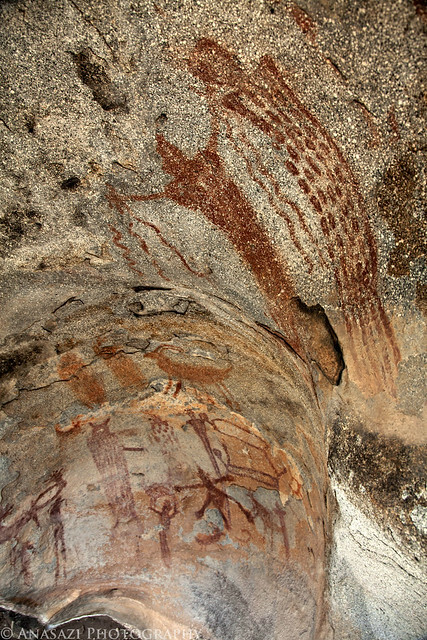 The main solidly-painted figure in the photo above seems to be holding no less than five snakes in it’s outstretched hands and then there is the dotted-figure next to it with a fringed bottom. Below these main figures you can see many of the other intriguing figures painted here in red and yellow pigment. This is a very interesting site that I would like to visit again when I am not rushed for time.